No matter the company’s size or industry: there is always at least one person talking about “making things more agile”. But what does it exactly mean? And how can it actually be put into practice and become more than the buzzword that every c-suite seems to enjoy using? Well, first of all in business context agility is synonymously used to say that something is flexible, proactive, and quick – characteristics that come in handy in a fast-paced and transforming world. But beyond this descriptive meaning stands an entire mindset and philosophy. A way of looking at challenges and doing things that goes a lot deeper than simply putting the agile label on everything that differs from traditional waterfall processes. In short: being truly agile is a question of corporate culture and perspective. With the digital transformation of all areas of life, not only the needs of people are changing by the minute. Also, the emergence of other new technologies is accelerating. The world is evolving faster and faster. Obviously, companies need to adapt to this pace and rapid shifts in market situations in order to be successful. Therein lies the need for being agile. To become agile, it helps to have a look at a shining example. One industry that is characterized by agility more than any other – and has been so for the last decades – is software development. It can serve as a model for every other industry wanting to be agile. While many areas are only now realizing the full impact of digital transformation, software development has been at the very heart of this development from the beginning. The way in which it understood the need for new approaches in a quickly evolving world can be best seen in the Agile Manifesto. It was published in 2001 after 17 leading figures in the software industry had met in the Utah mountains. Their common goal was to find the best possible workflows for software development. During their stay, they managed to identify and formulate common beliefs that are defined in the Agile Manifesto. Today, almost two decades later, it is more relevant than ever. Especially for other industries. The guiding principles formulated in the Manifesto are the essence of the software industry’s capability to keep up with the fast-paced, digitalized world. So, the most important questions that all other industries affected by this transformation have to ask is: What is software development doing differently and how is it able to turn the challenges of speed and flexibility to become part of its very nature? At the heart of the Agile Manifesto lie four key values that represent a departure from how new products were previously developed. They are the starting point for transferring “agile” into other areas. Individuals and interactions: The development team is the focus of the Agile Manifesto. True collaboration, personal communication, and an ambitious, trust-based work environment make successful problem-solving possible. Working software: Behind this value stands a strong "hands-on mentality", which leads to efficient and effective software development. Instead of lengthy documentation, focus lies on real problem solving. Minimum viable product instead of a polished end product. Costumer collaboration: Often the specifications change during the project. The team has to react fast accordingly. Open communication and cooperation with the customer help to respond optimally to constantly changing requirements. Direct customer feedback on prototypes or new features in a product can help you move things forward quickly and in line with your needs. Responding to change: Technology is changing, demands are changing, people are changing. Software development must be able to respond quickly to these changes and integrate them into the current processes. While these principles were originally formulated specifically for software development, they hold true for any other industry today. All it takes to make them fully applicable to other processes apart from software development are a few adjustments to broaden their scope. The speed at which new possibilities emerge is breathtaking. Virtual Reality, Blockchain or Artificial Intelligence have already become the new normal. The technological foundation for many potential game changers has been set over the past years. The practical applications will without a doubt follow at an exponential speed. But even as these “new” technologies are beginning to reach the mainstream the next big things are already in the making. Consequently, reacting to such developments is only one part of the challenge companies have to face. Keeping an eye on the horizon, identifying potential game changers, and understanding their implication is the second part. The pervasive nature of the advancements in digital technologies makes things especially important. As everything is becoming digital, it becomes even harder to anticipate the full extent of the impact of new developments. Companies who are not prepared to adapt to these new requirements will quickly fall behind. Therefore, it’s not only necessary for companies to become more digital but also to become faster and more agile. Nothing shockingly new here. So, the real question is: How to start and how to go beyond the buzzwords? 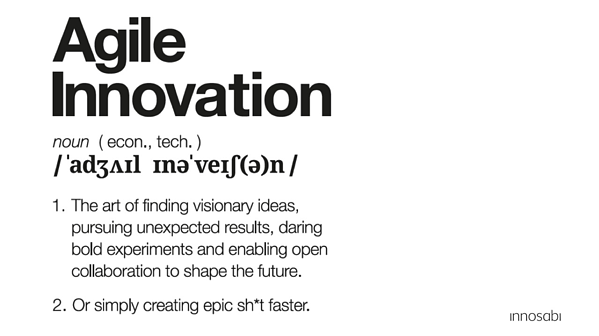 We believe that there is one area which benefits most from agile methods: innovation. But why is that? Simply put, the act of innovating often comes down finding a new solution to a problem. Not just any problem but a problem that often lies in the future. For this reason, the requirements for a solution can change again and again. Planning a project from start to end, and then adhering strictly to this plan is in many cases no longer the direct route to success. The circumstances are changing too fast. Whether these are changing user needs, technological requirements, consumer habits, or market dynamics: changes and the accompanying new challenges are inevitable. Nevertheless, words such as unexpected or unforeseen are red flags in classical project management. In contrast, they are no problem for agile teams. As described earlier, the key principles of agile software development provide a blueprint for bringing agility to other areas. I am in the fortunate position to have experienced first handedly how agility works in software development and how it translates to the field of innovation management. innosabi – the company I co-founded and manage as CEO – develops software solutions for innovation management in large companies. From day one, our developer team has worked with agile methods. Not long after, our marketing team adopted this mindset and started to work in sprints and tasks with great success. Today, all of innosabi is working agile. What allowed us to access tremendous potential and growth inside our own company is what we try to implement in the innovation management of large organizations. Solving complex problems, defying unpredictable changes and achieving great results – this is what agility is all about. As a guide, we adapted the Agile Manifesto and formulated our own principles: the Agile Innovation Manifesto. Openness over Secrecy: Openness means a sustainable dialogue in a large network of different people, including end users, external specialists, employees of other departments or even the general public, as well as employees in innovation management. It benefits from access to more knowledge, ideas and perspectives. But this also means that corporate structures with impenetrable borders between different departments, indeed a total of silos, can be a hindrance. Thus, openness and transparency can help to implement innovations better and faster. Prototypes over Finality: Changing products after launch is a difficult task. But sometimes improvements are needed to better serve the needs of users. Instead of developing an idea all the way to its market entry, prototype testing provides important feedback and reduce the risk of failure on the market. 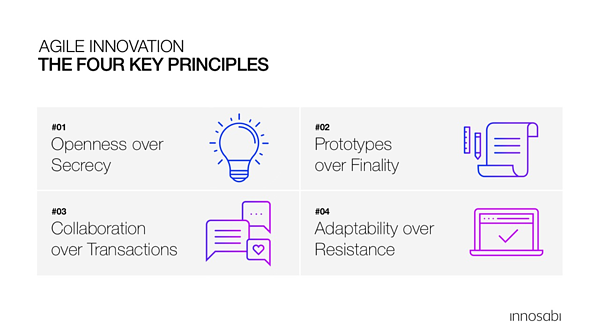 With iterative loops, in which consumers can try out and evaluate unfinished versions, innovation processes can set the foundation for success early on. In addition, this also helps to avoid putting too many resources into an idea that eventually would turn out to be a dead end. Collaboration over Transaction: Collaboration promotes innovation. It's not just about customer feedback, it's about collaborative exchanges between companies, employees, stakeholders and customers – the entire ecosystem. Boundaries between teams and departments are dissolved, even the division into manufacturers and users is softened. But keep in mind, we are talking about real collaboration here! Conducting a quantitative survey with customers or awarding large prizes in idea contests is not enough. The focus is on working together towards a common goal. To solve a problem in order to achieve a better result that benefits everyone involved. The principle can be used both with external stakeholders and within a company. Why should companies painstakingly transfer knowledge and know-how from other departments to innovation management if there is the possibility of involving all employees in a common innovation process? Embrace the dialogue! Adaptability over Resistance: Change cannot be avoided in a world that is always changing. But an agile approach is about not just reacting to change but acting proactively. The added value in the adaptability of a company is thus not only in the output. When we speak of the application of agile principles in innovation management or product development, we do not only speak of methodology, but also of a change in corporate culture. Because only when it is anchored in the culture that changes or adjustments to a product are no problem as well as a certain flexibility in the innovation processes, companies can face new challenges. The paradox of the modern corporate world is that almost every industry feels threatened by uncertainty and disruption but at the same time there is more information and data available than ever before. So the problem really is that information and knowledge are often not properly used or included in decision making. Adopting agile principles and aligning your organization with them is the first step to solving this challenge. An agile mindset deeply embedded in the corporate culture enables a constant look beyond the own organization. At every point along the creation of new products or services and by all individuals involved. With the right agile processes and mindset incorporating or reacting to these insights should not be a problem. This is only possible when agility is understood in its entirety. When going beyond the buzzword and mere process optimizations. For software development, the idea of agility became the central element that defined the identity of an entire industry. It helped to establish a shared foundation for software developers across organizations and nations. And at the same time set the industry apart from the processes of the analog world. In doing so, the agile principles defined a new type of work culture perfectly aligned with the requirements of a digital environment. A transformation that the world outside software development needs to catch up with. In our experience, the Principles of Agile Innovation can only be successfully practiced with the right tools. To enable an agile mindset across entire organizations and ecosystems a scalable digital infrastructure for the right forms of collaboration and knowledge exchange is paramount. Whether it is internal collaboration in highly technical innovation projects or external collaboration with consumers: the desired outcome and the characteristics of the target audience determine how agile principles can be best put into practice. This means, that agile innovation with your customers might function entirely different compared to one with your own employees. This might sound like a huge effort and investment. But here’s the good news: you don’t have to do it all at once. Find the right starting point and go from there. Do you already have an accelerator program for employee ideas? Then just make it agile with the right platform for large-scale collaboration, resource funding, and prototype testing. What about customer panels? Why not use these contacts and invite them to a continuous exchange and ideation projects instead of isolated focus groups or surveys? There are many more groups and individuals within your ecosystem that can be engaged in agile ways along all steps of the innovation process: suppliers, research institutions, or even the general public. Fully transforming your company and imprinting the agile mindset inside your culture like in the software industry will take time. But the only way to get there is by simply starting it. Living it. And by setting the first examples for all others to follow. If you kept reading until now, you might wonder: “Ok, sounds good. But how does it work in practice?”. I will share some examples from our clients in upcoming posts here and on our homepage. Still, this is only a small portion of our extensive hands-on experiences in the Age of Agile and our vision of digital ecosystems for innovation. For everyone who wants to learn even more about Agile Innovation methods and get inspiration for transforming your own company, I have great news: We will soon publish a whole book on this topic! Connect the Dots. It is currently in the making and will hopefully be finished in a couple of months. You can head over to our homepage and sign up to get a free copy once it is out. If you can’t wait until then, feel free to get in touch with me or one of my colleagues to talk with us directly or get a first-hand look at how our solutions and methods work in practice. 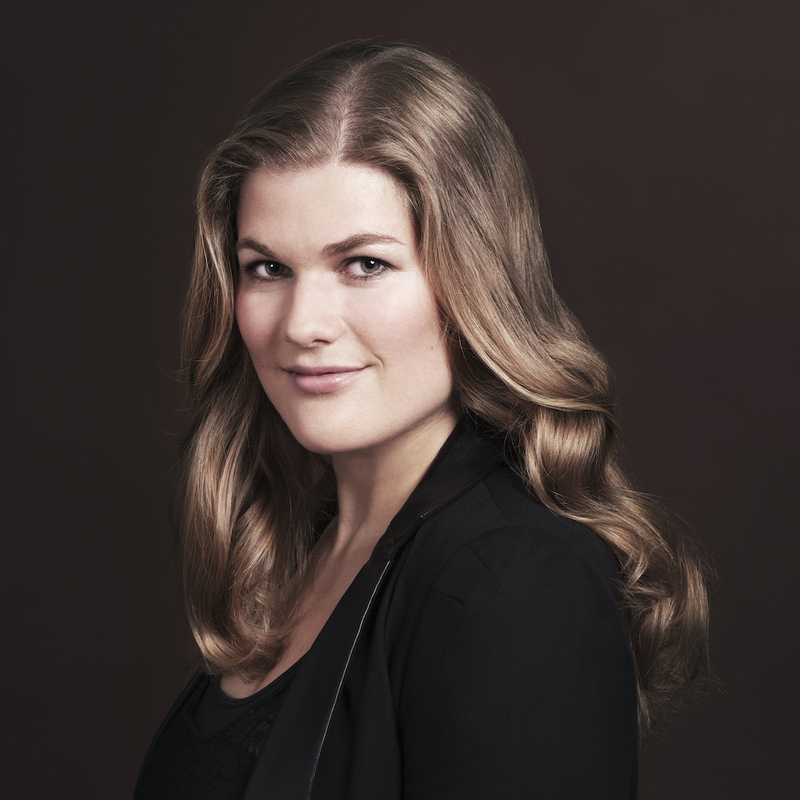 Catharina van Delden ist Mitgründerin und CEO von innosabi, Schatzmeisterin und Teil des Präsidiums des Digital-Verbandes bitkom, Mitglied des Beirats der Deutschen Bank sowie Teil des Beirats „junge digitale Wirtschaft“, der den Wirtschaftsminister berät.